On Wednesday, November 9th Fooq’s & Friends presents “OLLA,” by guest chef, Scott Linquist of COYO Taco. 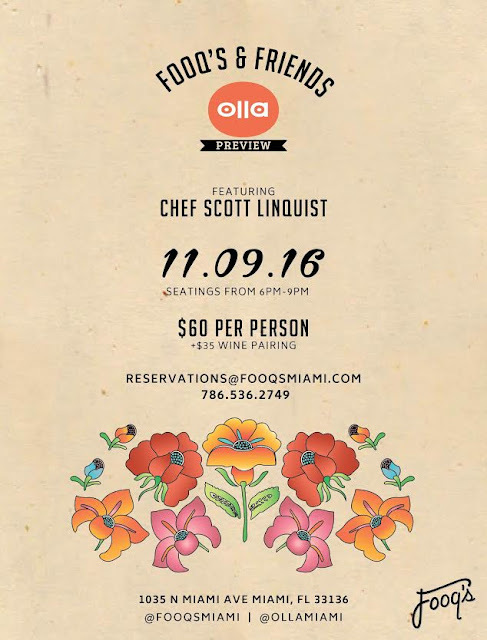 Guests are invited to experience Chef Scott’s newest project OLLA before debuting on Miami Beach in late November. Chef Scott will prepare a selection of classic moles derived from the Oaxaca region. During the dinner, guests will be guided through four distinctly different preparations of mole in addition to an amuse of island creek oysters paired with sangrita verde and a shot of Illegal Mezcal Joven. To end the evening, dessert will include Pistachio Crepes, roasted bananas, goats milk dulce de leche, vanilla bean ice cream and Café de Olla, classic spiced mexican coffee, canela, piloncillo and topped with mezcal crema.